A race of hostile aliens descends upon the earth to harvest humans and use them as meat for their intergalactic fast-food. 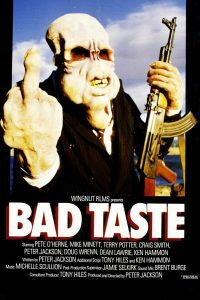 Bad Taste is Peter Jackson’s first long film…and a horror-comedy classic. Lots of critics praise Bad Taste as one of the best horror-comedy ever. I would not go that far (Braindead, for example, was much better), but it is for sure a truly hilarious one. If we put aside the comedy aspect, the film’s story is quite shallow and the paste of the film quite slow. But that wouldn’t be a clever thing to do since Bad Taste is, in the true vein of cult B-movie, really fun to watch. 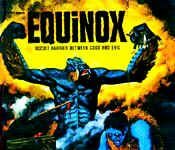 It combines an interesting “so bad that it is so good” aspect (the special effects for example) and some devastatingly funny scenes. Much better than the average B-horror comedies. Now if you put in perspective that Bad taste is a low budget movie, shot around Peter Jackson’s house, and that all the special effects have been done Jackson himself, you get an idea why this movie deserves to be so popular. There are some really great scenes like the one in which the main character puts back his brain in his head and carry on walking as if nothing had happen! There is also some good and very funny gore in it. This film is a must-seen for those who enjoy horror-comedy or Peter Jackson work in general. Peter Jackson is actually playing a main part of the film, try to find him!